When Johnny’s Restoration and Auto Trim loaded “Imagine” off the trailer at Autorama 2018 it was clear the car was a serious contender for the 2018 Ridler award. The Tri-Five is one of the most iconic platforms in all of hot rodding. 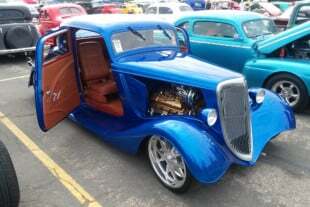 Pro touring, Gasser, Lowrider, lifted, slammed, chopped stock, they have been done in every style possible. Yet, even though we like to say we’ve seen it all, we’ve seen nothing like Imagine. The first, and perhaps most drastic, stylistic choice Johnny’s Auto Trim & Rod Shop did was remove the iconic side trim. Sacrilege to some, but just the tip of the iceberg of significant body modifications that make Imagine unique. A three inch chop gives the roof an entirely new roof line. In addition to the chop the window glass is laid back and sunk into the roof for a modern look to a classic body. Chopped, sectioned, and channeled the side profile of Imagine is unlike any other Tri Five. 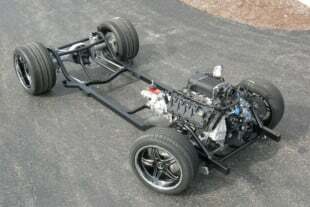 Tweaking the side profile even further, the body has been channeled three inches over the custom tube chassis. It’s also been wedge sectioned one inch in the back and three in the front. That’s where the new forward rake comes from and sleek thin front fenders. Hanging off the chassis is a coil over suspension set-up made using custom control arms. Every pivot point throughout the car uses a visually appealing and functional ball and socket union. Everyone of these ball and socket joints has been billet machined. Billet ball and socket joints are used throughout the entire vehicle. For every custom billet part on this car there’s a matching one off chrome plated part. Starting at the front, the headlight rings, grill surround and grill insert are Johnny’s Auto Restoration built. As are the one piece bumpers, window trim, and door moldings. Tri Fives are known for the iconic hood bullets, and Johnny’s changed those as well. These bullets are now functional, providing fresh air to the engine bay. The iconic 57 "bullets" are now functional intakes for the twin turbo big block Chevrolet motor. The fresh air is utilized by a Nelson Engines designed, twin turbo, 515 cubic inch big block Chevrolet motor. Tom Nelson mentioned on Instagram that the motor and associated plumbing was designed fourteen years ago. Proving that if you do something right, once, it will stand the test of time. Beautiful hardly describes the symmetrical engine bay. The same PPG paint used on the exterior is found under hood joined by immaculate chrome. Between the fenders are even more one off billet machined pieces. The turbo rings, hood hinges, intake manifold, and valve covers were all built specifically for this motor. Billet turbo rings, valve covers, and hood hinges help put this engine bay over the top. The engine covers that make the motor look like a part of the body are again, all custom made pieces. From where we were standing we could hardly see a single piece under hood (or anywhere on the car for that matter) that came straight off the shelf. This engine isn’t just for looking at however. It makes 1000 horsepower on pump gas. On race gas it makes 1800 horsepower. 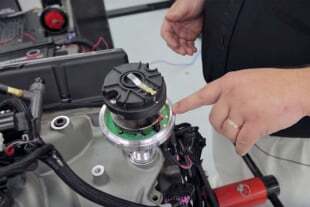 A torque tube sits between the built Turbo 400 transmission and Corvette rear end. Each end of the torque tube features custom billet ends. On the tail end the tube rotates 4:11:1 gearing. The painted, cut, and polished under body features a hanger less custom exhaust. A hanger-less exhaust snakes through the under body, beside the aforementioned custom tubular chassis. That chassis has been molded to the body. That’s attributes to the underside looking so flawless in the photo above. The large 19" and 21" wheels tuck under the PPG painted body beautifully. Footwork consists of massive 19″ and 21″ wheel combination. The wheels are designed to resemble hub caps, with a modern twist of course. Interior re-trim experts, Johnny’s designed and crafted the interior in house. A custom console now sits between custom bucket seats. Classic instruments gauges have been installed in a custom gauge pod in front of an Evod wheel. 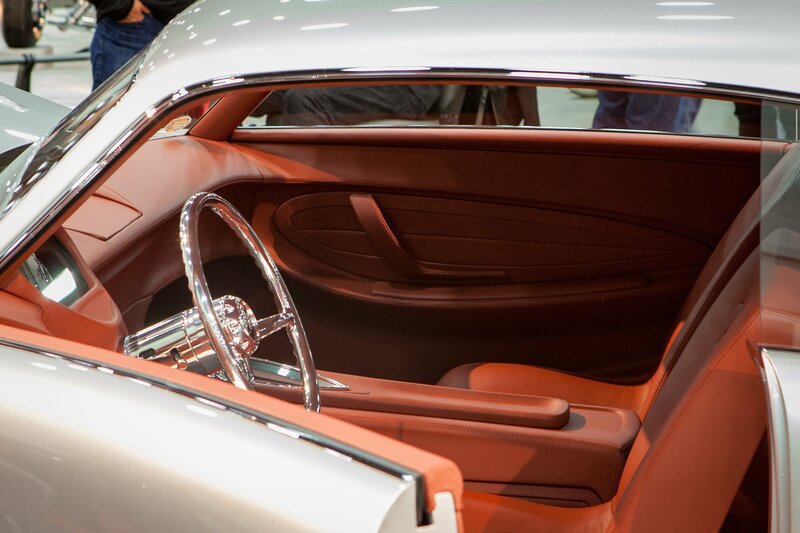 The entire interior has been done in rich orange leather. Greg & Judy and everyone involved from Johnny’s Restoration and Auto trim have every reason to be incredibly proud of what they created. Building Imagine took owner’s Greg & Judy Hrehovcsik on a journey that spanned nearly two decades. That’s a long time to build a car but worth it to build a Ridler winner. The 2018 competition was fierce but they unquestionably made it to the top of the pack. Congratulations to them, once again and we’re already keen to see what new heights the Ridler award competition enters next year.